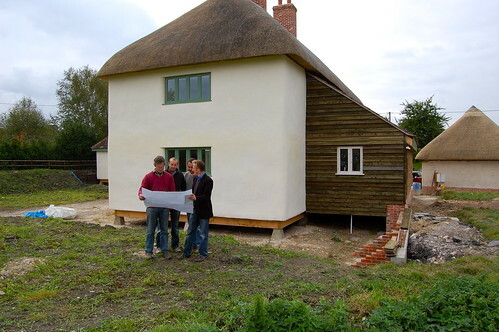 Work on what is believed to be the UK’s largest straw house is nearing completion. After twelve months of huffing and puffing, builders working on the five-bedroom detached country house at Rushall, between the Wiltshire market towns of Marlborough and Devizes, say the unique home should be ready to move into by the end of November – and it won’t blow down. The house is the dream home of Nigel Wookey, who farms 5,000 acres around Rushall and the neighbouring parish of Upavon. The pioneering farm was one of the first in the country to adopt the organic farming method – Nigel’s father Barry started the process way back in 1970. It was important, said Nigel, that the house was as sustainable and ecologically friendly as it could possibly be, with materials and labour being sourced close to home. The property was designed by Nigel Keen, of DRA Architects in Devizes, who has attended training courses in constructing straw buildings. As well as making the building sturdy, the house has been designed to be energy efficient, with plenty of glass on south-facing walls to let sunshine stream in. Meanwhile, the entire structure has been floated on staddle stones, which keep the bales dry and minimise the environmental impact of digging foundations. 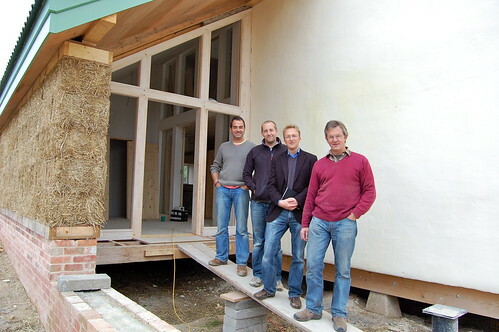 Transforming 1,200 straw bales into a substantial country property has also been a steep learning curve for builders Steve Pullen and Marc Powell of Treadstone Carpentry Solutions Ltd, a Rushall based company. 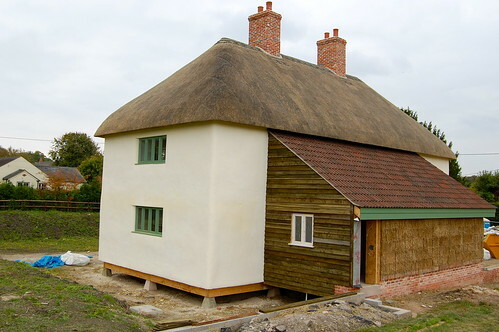 The bales were compacted to maximise strength, with the two-storey section of the house being built around a timber frame made from sustainable wood, whilst the walls of the one-storey section are load-bearing. The straw is so tightly packed that it does not present a fire risk, and it also provides terrific insulation, as does the straw to the thatched roof and the bales in the space under the tiled roof. The bales, which are pinned together with hazel stakes, have been rendered with lime inside and out, which helps with insulation, protects the natural materials beneath and has the benefit of looking extremely attractive. Besides the five bedrooms – three of which are en suite – family bathroom, living room, dining room, spacious entrance hall and a whopping great kitchen with wood-burning range, the property also has a double garage made of cob, a mixture of straw and mud. Having cut their teeth at Brambledown, the architect and the builders are keen to construct more straw buildings. Mr Keen said: “Everyone has been fantastically supportive of this project, from the planners and building control officers at the local council to members of the community, who have been fascinated to watch the house develop. 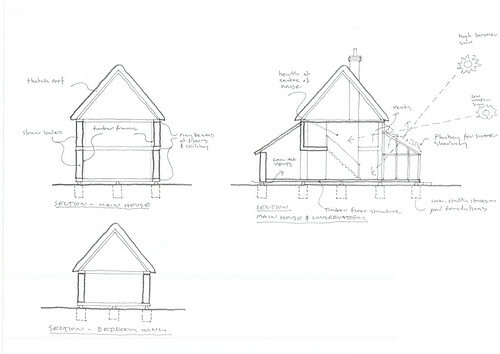 “Although the house is unorthodox, the owners will not have to slum it! All the mod cons, and more, that you would expect in a brand new property have been integrated into the design, including environmentally-friendly air-sourced under-floor heating, low-energy lighting, and water sourced from a borehole on the property.